All departmental LANs are connected to the campus Gigabit Ethernet backbone as subnets of CTNET and therefore have access to all the facilities in the central host computers. The CTNET currently has a total of over 80 staff LANs. These LANs have standard setup for both academic and administrative departments. They support around 4,300 staff machines, over 717 network printers, and provide access to more than 400 software applications running under the Microsoft Windows environment. A single Windows 2008 R2 Active Directory domain has been set up to host all staff and student LAN accounts. Several domain controllers are in place to serve logon requests of around 35000 users all over the campus. A central NAS with SAN storage is deployed to provide a fault-tolerant, ever-lasting file service. A MS Windows 2008 server, hosted by VMware cluster, is configured to offer central print services for all departments. Most of the printers are inter-connected via the network print server devices which are capable of handling print jobs from PCs, Macs, and UNIX workstations at the same time. The CityU software environment for all departments is offered by a 2-node Microsoft IIS NLB cluster. Most commonly used software applications are delivered through the central NAS. To ensure performance, each staff workstation is connected to a dedicated port on the Fast Ethernet switch. 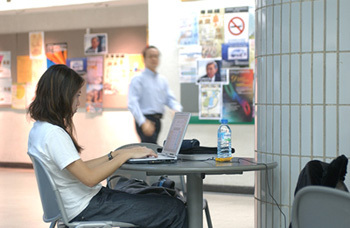 CTNET at present has over 40 student computer rooms, offering more than 350 software applications to around 1,500 workstations. About 50% of student LANs and workstations are located in the Teaching Studio Areas of Computing Services Centre (CSC) and the rest are distributed in different academic departments. Most student LANs are managed by the CSC and CSC is currently holding over 60,000 user accounts. About 900 Intel Core i5 PCs are set up in the CSC teaching studios. These PCs are served by advanced servers running the Windows 2008 R2 Server operating system at 1Gbps network bandwidth. Each PC has at least 4GB memory, a local hard disk of 500GB, DVD-RW drive, LCD display, and enjoys a 1Gbps network bandwidth. Network printing to laser printers is provided. All PCs in the CSC Teaching Studio Areas support both Microsoft Windows 7 and Microsoft Windows 8 environment. When a PC is booted up, the OS menu will be displayed. After the OS (Windows 7/8) is selected, the PC will bring up the OS and the University homepage will be shown. From the homepage, users can then login Portal and navigate to the information they need. Software for accessing various host computers and Internet are also included as part of the application software repertoire. For details on the use of the CSC Student LAN, please refer to the Student Guide published by the CSC. X server program is available in all CSC teaching studios to support the teaching of UNIX/Solaris and applications available on the Sun platform. The X server program is run on Windows environment and remotely connected to the Sun UNIX/Solaris system with graphical user interface. Authentication is done by the NIS+ servers. These are part of the CSC student LANs. In Phase I and II, there are about 2,700 network points installed, one for each student in their rooms. When Phase III and IV are completed, more than 3,500 network points will be installed. These LANs belong to the lecture theatre network. PCs supporting MS Windows 7 environment are installed in all lecture theatres and classrooms for teaching use. There are altogether 163 classrooms and 31 Lecture Theatres distributed through the entire campus .These classrooms have also been equipped to support multimedia applications. Express Terminals are located all over the campus, which allow access to network services on the CTNET. For security purpose, lecturers and students are required to use their staff/student ID cards and enter their passwords for logging into the network. CityU wireless local area network (WLAN), introduced in 1997, is a flexible data communication system using radio frequency (RF) technology to transmit and receive data over the air. It is used as a supplement to our conventional campus network and allows our staff and students to enjoy mobile network computing without the need to look for a physical network port. The WLAN infrastructure is built on Industrial Standard IEEE802.11a/b/g/n high-speed products and users can use their own notebook computers with compatible WLAN cards to access the CityU WLAN. Most areas on campus are covered with 2,300 access points providing a total capacity of over 10,000 concurrent connections for Intranet and Internet access.